Elements Applied: Leaves are commonly applied in herbal medicine. Active Components: Ginkgo biloba extract can be characterized by two main classes of active constituents, which take responsibility for its effects: terpene lactones and gingko flavone glycosides. Gingko extracts are commonly marked by 24% concentration of ginkgo flavone glycoside which means the medicine is standardized to bioflavonoid content. Bioflavonoids take responsibility for ginkgo’s antioxidant capacity and its ability to decrease blood clotting. Due to this reason gingko extracts (or GBE) are commonly applied to impede circulatory conditions, like atherosclerosis, as well as stimulate normal functionality of the nervous system. Terpene lactones, present in GBE, which are namely bilobalide and gingkgolides, promote blood circulation and its sufficient supply to the brain and other body organs. Bilobalide ensures stable protection for nerve cells. According to recent researches on animals, bilobalide is helpful in recovering destroyed nerve cells. History: Ginkgo is the most ancient tree found across the globe. It has preserved its appearance and characteristics for several million years. According to Charles Darwin, this plant is an unquestionable benefit for human health. Gingko is characterized by its miraculous ability to withstand radiation, pollution, insects, fungal and viral infections. Gingko tree is the only plant which was found to stay safe after an atomic bomb exploded in Hiroshima. Due to its long lifespan this tree is used as a decorative plant in the US green areas. The species is characterized by a lifespan of more than a thousand years. Used For: The range of conditions in which the herb is applied includes tinnitus, vertigo, intermittent claudification, as well as organic brain dysfunction. Ginkgo is successfully applied for brain disorders, associated with anxiety, emotional swings, headaches, tinnitus, and giddiness. Ginkgo is also stated to enhance memory function and concentration, impaired by peripheral arterial disorders. Moreover, the plant can be useful in treating Raynaud’s phenomenon, multiple sclerosis, migraine headaches, macular degeneration, intermittent claudification, infertility and impotence in men, diabetes, depression, congestive heart failure, cerebrovascular insufficiency, and atherosclerosis. Ginkgo is capable of enhancing blood circulation both in the body organs and in the extremities. Besides its ability to decrease blood clotting, it also possesses a vessel toning capacity. Speaking easier, it provides effective blood circulation. This capacity can be witnessed in body vessels of any size and value. Ginkgo is characterized by antioxidant activity in the cardiovascular system, eye retina, and the brain. This capacity is strongly related with GBE’s ability to prevent and delay brain disorders, associated with aging process. Its antioxidant effect, imposed on the brain, is in primary focus, due to the fact that the nervous system is most frequently exposed to free radical attacks. This in turn increases the possibility of nervous disorders like Alzheimer’s disease. Moreover, ginkgo components are known to decrease the amount of PAF, dubbed as platelet-activating factor. This agent is highly responsible for blood clotting. Excessive PAF quantities in blood make nerve cells vulnerable, due to low blood supply to the nervous system. PAF also triggers inflammatory diseases and nervous conditions. PAF increase is linked with the aging process. Bilobalide and ginkgolides guard the body against lack of oxygen in the tissues. Ginkgo improves blood supply to the central nervous system, and restores normal functionality in the nerve cells. Ginkgo’s effect on cerebral vascular deficiency and worsened mental ability in aging patients is proven by hundreds of scientific studies on thousands of participants. Ginkgo’s active constituents produce a positive effect on body and mind. Plant extract is known to produce an antioxidant action, thus making nerve cells stable. According to lab researches conducted on animals, Ginkgo is capable of relieving depression and anxiety. Ginkgo is useful for treating a range of premature aging symptoms like: erectile dysfunction due to decreased blood flow in the penile tissues, decreased blood circulation in the body extremities, inner ear dysfunction, which may lead to impaired hearing, macular degeneration, which may lead to blindness, tinnitus, headache, vertigo, decreased intellectual ability, poor concentration, memory impairment, depression and anxiety. Preparation and Intake: The majority of patients find it sufficient to take 120-160 mg of Ginkgo extract, standardized to 24% of flavone glycosides and 6% of terpene lactones, thrice per day. People suffering from resistant depression, memory loss and confusion, as well as cerebrovascular deficiency, take the extract at a dose of 240 mg a day. 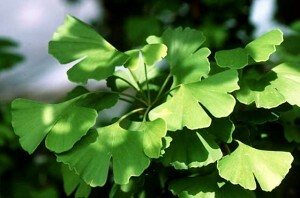 In order to benefit from Ginkgo intake, the remedy should be used at a period of 6-8 weeks. In form of tincture the herb is taken at a dose of ½ ml thrice per day. Safety: Ginkgo medicines are stated as generally safe and devoid of adverse effects, if used according to instructions. Some individuals, who used abnormally large amounts, were reported to have restlessness, giddiness, vomiting, nausea, and diarrhea. In case you feel the negative impact, reduce the dose. If the adverse condition is acute, quit taking the remedy. Ginkgo extract is effective in reducing blood coagulation, and thus should be reconsidered by people using aspirin and other medicines, which reduce blood clotting. European doctors recommend ginkgo in lower amounts (40 mg per day) in case an individual takes aspirin and other remedies to improve blood circulation. Ginkgo biloba is safe for use by pregnant or breastfeeding women. It’s worth noticing that poor blood circulation in elder people may lead to serious health conditions. Individuals suffering from it should speak to their health-care provider first, in order to prevent sad consequences.